Avid4 Adventure’s 7th – 11th grade resident overnight camp is located at Windy Peak, a gorgeous private camp in the Rocky Mountains near Bailey, Colorado. Originally built as a summer camp site, then converted into a school, Windy Peak has the feel of a quintessential sleep-away camp, outfitted with all the amenities and safety standards of a modern school facility. And with over 200 private acres surrounded by thousands of acres of national forest, the scope for adventure is (almost) endless. Learn more about the facilities and recreation areas at Windy Peak below, and visit our FAQs for answers to your other questions. Much more than just a place to eat, our two-level dining hall is a place where the whole camp gathers to visit outside their cabin groups, sing songs, listen to announcements and fuel up for the day’s adventures. We serve three healthy, hearty, family-style meals every day (plus have plenty of nutritious snacks for extra energy between mealtimes) and can accommodate any allergies or dietary restrictions. Learn more about meals and mealtimes. One of our favorite camp meeting areas, the gazebo hosts our opening and closing ceremonies, weekly barbecues, skit nights and campfires. Our on-site clinic is staffed with professional nurses and equipped to handle most medical situations that arise at camp. Complete with private rooms and bathrooms, our clinic is open 24 hours a day to treat cuts, bruises, stomachaches and homesickness, or just to provide a quiet place for campers to regroup. We also keep camper medications locked up in the clinic to be administered by nurses as directed. Windy Peak is covered in miles of trails, ideal for hiking, biking and learning. Campers can investigate plant life on the lush Forestry and Ecology Trails, learn the history of the area along the rocky crags and old mining sites of the Geology Trail or practice beginning bike skills on the Planetary or Freeman Trails—and that’s just what’s on site. Our clean and comfortable cabins are campers’ home sweet homes during their stay. We have 13 cabins located along “Cabin Row” that can accommodate anywhere from 10 to 24 campers, grouped by age. Cabins are single gender, staff supervised and outfitted with bunk beds, heating, fire alarms and emergency intercoms. Campers make their beds every morning and do regular chores to keep their cabins neat and cozy. On site at Windy Peak and easy to navigate, Nelson Pond is a perfect place to teach campers the basics of kayaking, canoeing and stand up paddle boarding. It’s also where campers come to go logrolling, or participate in an early-morning polar plunge. Designed as a low-key place to gather after full days of adventuring, our recreation area gets campers of all ages together for all kinds of activities—basketball, gaga pit, soccer, kickball, Frisbee, 9 Square in the Air, slacklining, dance parties—and provides a perfect spot to spend some unstructured downtime. While some cabins have single toilets, all campers are an easy walk from our central shared bathhouse building, which has separate facilities for boys and girls with plenty of sinks, toilets and private showers. Located in the woods at Windy Peak, our low ropes challenge course gives campers plenty of opportunities for fun and fulfilling team building. Our well-maintained and carefully safety-checked course includes elements like a Mohawk Walk and Whale Watch. Our archery range is located on site at Windy Peak and offers a safe, spacious place for target practice with bows and arrows. 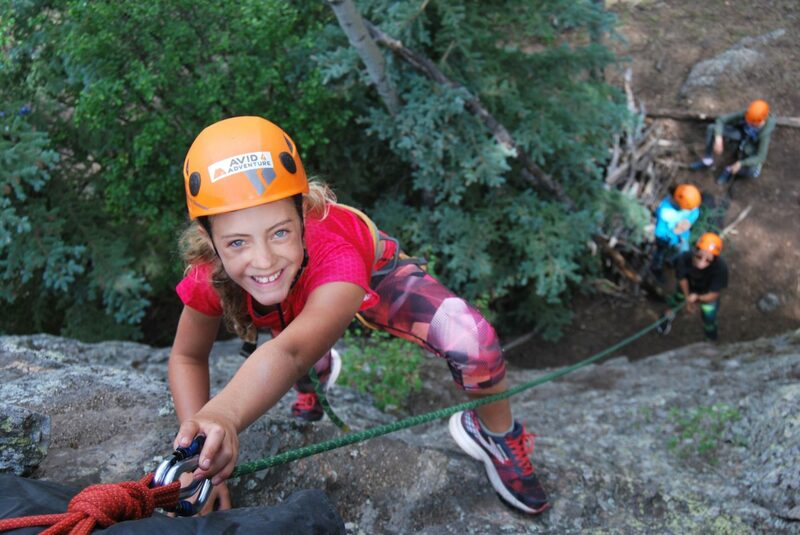 Using their rock climbing skills and plenty of safety equipment, campers climb 40 to 60 feet up Windy Peak’s giant ponderosas and do like the monkeys do—swing through the treetops and jump from branch to branch. Just a mile down the road from Windy Peak sits Wellington Lake, a 167-acre body of water in the shadow of an impressive rock formation known as The Castle. This gorgeous alpine lake has plenty of still, easy spots for campers to practice paddling, along with more challenging sections to try when they’re ready. In addition, Castle Mountain Recreation gives us private access to this top-notch climbing site, an ideal spot to get kids comfortable climbing on an authentic, uncrowded crag. Campers put their mountain biking skills to the test on Buffalo Creek’s world-class trail system. Home of the Bailey HUNDO and a popular spot for pros to train, Buffalo Creek boasts a huge variety of terrain—single track, double track, downhills, sand pits and creeks—giving campers an unequaled opportunity to practice technical biking. Housed in a very cool 19th-century building, the Trading Post is campers’ one-stop shop. It’s stocked with healthy snacks, industry-standard outdoor gear and Avid4 Adventure merchandise, plus anything campers might have forgotten at home (cameras, toothbrushes, stationery, journals). Parents and campers can visit the trading post on check in /out days and anytime online. See our Trading Post FAQs for more details. Throughout their two-week session, campers try outdoor activities includes archery, whitewater rafting, and tree climbing. Rounding out the experience are games, traditions and bonding that leave campers with lifelong memories and character-shaping confidence. Our Leaders-in-Training Program gives teens life-changing opportunities to take on meaningful leadership roles at camp, push their limits on a five-day expedition in the wilderness, building lasting knowledge and experience they can use throughout their lives. During this two-week session, you'll gain invaluable leadership experience. You'll mentor your own group of campers, receive specialized training in Leave No Trace, build skills in outdoor adventure sports, and even learn to be a zipline guide.